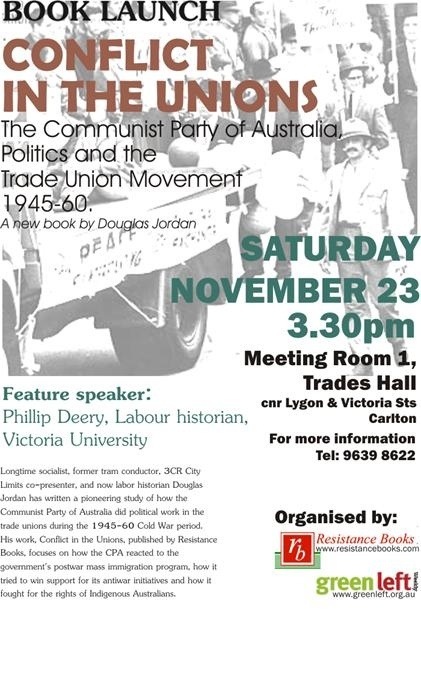 Longtime socialist, former tram conductor, 3CR City Limits co-presenter, and now labor historian Douglas Jordan has written a pioneering study of how the Communist Party of Australia did political work in the trade unions during the 1945-60 Cold War period. His work, Conflict in the Unions, published by Resistance Books, focuses on how the CPA reacted to the government’s postwar mass immigration program, how it tried to win support for its antiwar initiatives and how it fought for the rights of Indigenous Australians. Keynote speaker: Phillip Deery (labour historian, Victoria University). 3.30pm (for 4pm start). Meeting Room 1, Ground Floor, Trades Hall, cnr Lygon & Victoria Sts, Carlton. Organised by Green Left Weekly & Resistance Books. For more information ph 9639 8622.